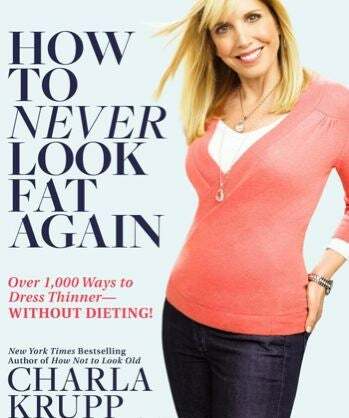 Charla Krupp, having told women how to age, is back to tell us how to dress. Her "secret"? Giving women knowledge of what Krupp calls "fattening clothes." Which you should avoid, because they are like so bad, like cookies! As weight-conscious women, we are aware of calories as well as fat grams. We are constantly monitoring what we put in our mouths. If you have an entire pizza for dinner, you are not likely to top it off with dessert. Because pizza alone is going to max out your calories and fat intake, pretty much no matter what diet you're on. Now if you stayed no-fat all day, when the dessert cart rolls up, you may feel like you can indulge in one perfect chocolate chip cookie. So it's no surprise, really, that all the outfits Krupp has put together for Time.com are — well, inoffensive, but nothing special. (If you're curious as to why Krupp seems to get featured in Time so often, it might help to know that she's married to this dude.) If you want to look thinner, sure: avoid horizontal stripes, favor things like well-cut LBDs, and think twice about any garment which features repeated round shapes. But for every slide, my mind was racing to the exceptions: what if you like your portrait collar empire-line dress? What if that t-shirt is more practical than the bat-wing dolman blouse that hides your upper arms? What if the chunky heels make you feel cooler than the stilettos? The idea that all women have an inflexible and rule-obsessed relationship with food, and that we ought to visit the same neurosis on our wardrobes is just daft and insulting. I'd wager that most women know how their clothes make them look. We get told often enough by the culture at large, by our peers, by older women, and by men. Clothing is a nuanced system of representation into which women are initiated early. We choose outfits for how they make us feel, for how they express what we feel, and for how they inspire others to treat us — among other reasons. Krupp collapses — or ignores — this complexity: "The question that every woman I know asks herself before she walks out of the house is not 'Do I look chic?' or even 'Do I look good?' but rather 'Do I look fat?'" I have to say, it strikes me as a sad and rather flat way to go through one's sartorial life.